think I’ve blogged a buncha these, but they remain kinda stealth Matamps. This is a 50w with the aluminium knobs I’ve not had before. The knobs are much fancier in person, look kinda tacky in photos, machined aluminium to touch. Unpopulated valve bases. 100w PT topside too, so probably built mostly and finished as 50 or 100w to order. 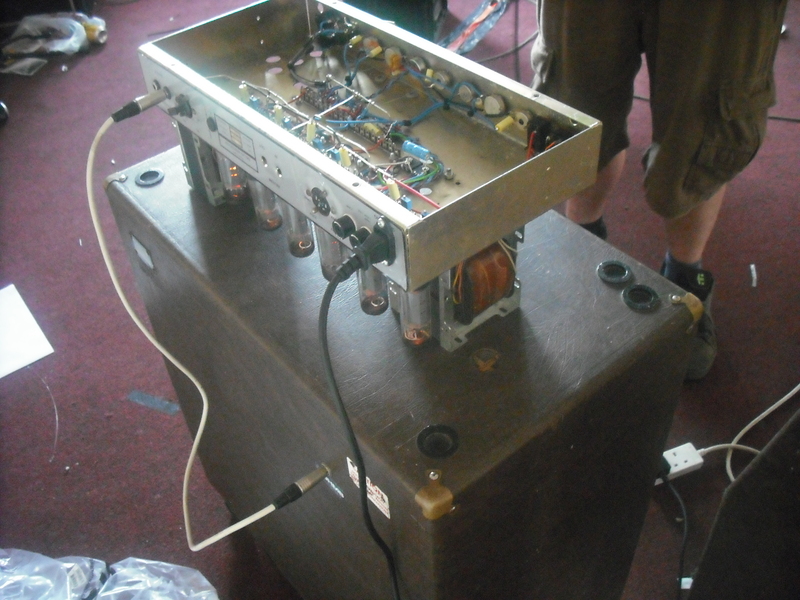 Loaded with 6550, sounds great with bass, so I left it like that, bunch of the JJ pres were dead/microphonic. For sale, £400. Couple of Warrior Pope vids, Peavey Artist guts. Pedals for sale. Did some videos for Warrior Pope live recording. This Peavey Artist came in for triage, touring band from Sweden, different electrical regs there so shenanigans inside. Fuse on the bias is a genius plan. Blown fuse on the board, and this cooked looking cap is prob the issue, but not one I have to hand. Put a new fuse in and wished him luck, apparently it works, will need a proper sorting when they aren’t on tour. Or just look up Tone Wolf Audio on Facebook. Email about these, don’t comment, I get no notification of comments. Details of some are in the blog, but better emailing about them. Kelly McKay Sound 50w 2×12 combo. £450. 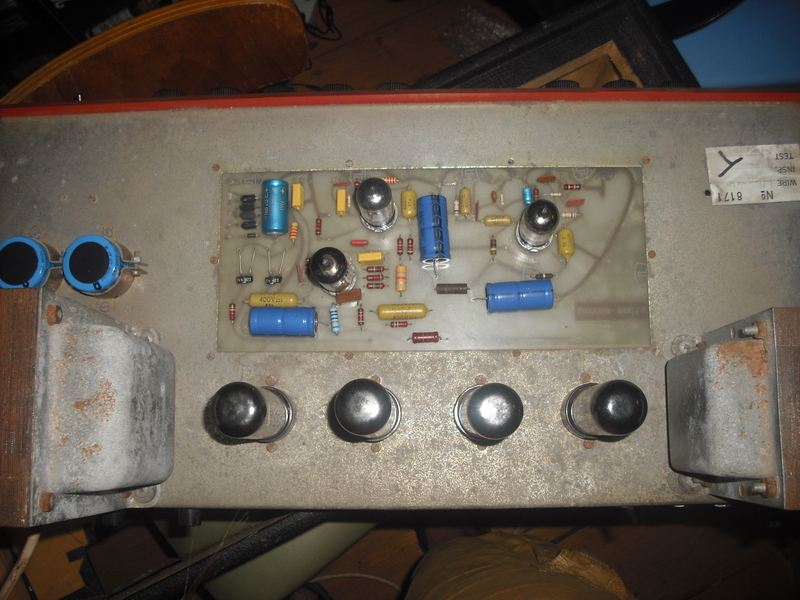 Later PCB model.Been recapped and the voltage selector made internal. 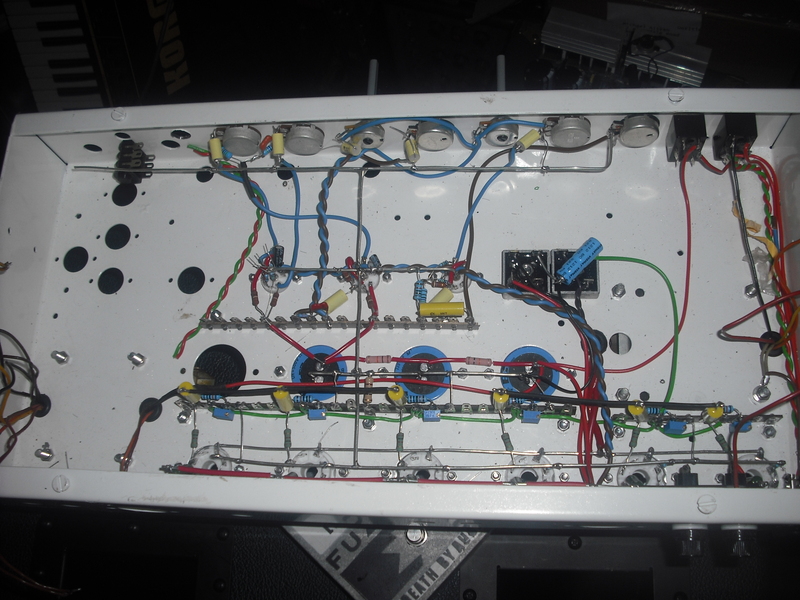 Also tone control switches using various cap values fitted on the back, but disconnected. £700 if anyone wants it. Been working on using the pile of Sound City 120 PAs as a base for new amp builds, since they don’t retain much value, being PAs. Basically, taken a Sunn Model T preamp and built on to updated output section of the 120 (different PI, individual bias), assembled in a bus bar style (sort of like all the stuff people claim of point to point, but true because you can have a good layout with it). 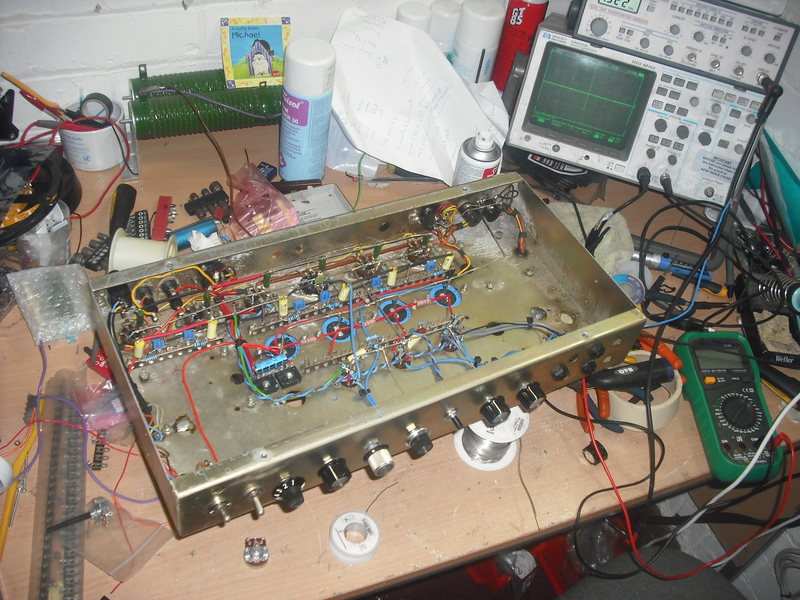 Travelled up to Sheffield to visit Aitken Audio with the prototype to get it tweaked and talk plans. Prototype on the bench having tweaks after first round of testing, addressed some mechanical potential issues, tone control sweep and gain levels. Blasting it through a vintage Acoustic cab, check it does what its supposed to. Seems a fair bit of instrument character comes through in spite of being driven pretty hard. Next one started in powder coated chassis. 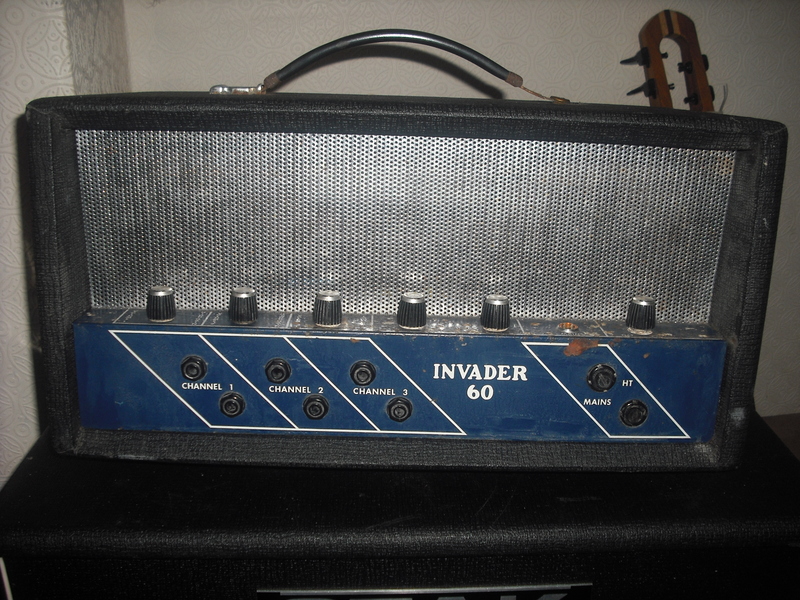 Also collected this Invader 60 from being sorted. 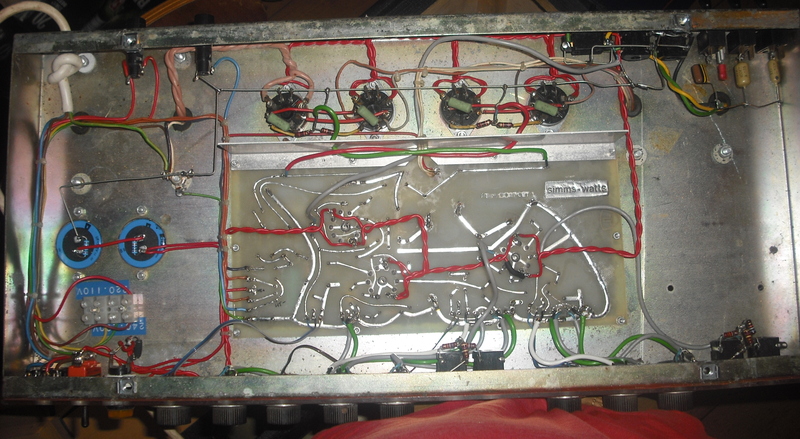 Weird layout, interesting amp, with a pretty good sound, gets pretty snarly dirty when pushed. Plus the tone stack is pretty nice, 2 band, actually does stuff. 2 EL34. £250.